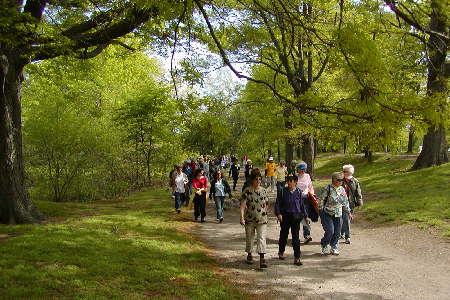 From May through October, the Conservancy offers a series of guided walking and bike tours led by Emerald Necklace Conservancy docents. Visitors can stroll among scented blooms, take a walk into history, discover the hidden gems of the Back Bay Fens landscape or ride along the bicycle paths to explore more of the Necklace. Guided walking tours are free, but a suggested $10 donation is requested. All tours start from the Shattuck Visitor Center unless otherwise noted. Wear comfortable walking shoes and bring a refillable water bottle. Check back here for weather-related cancellations or schedule changes. 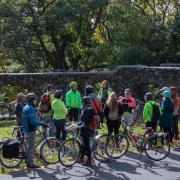 Join the Emerald Necklace Conservancy for a guided, interpretive bike tour from the Back Bay Fens to the Arnold Arboretum, led by a Conservancy docent. Begins at the Shattuck Visitor Center, 125 The Fenway, Boston, MA 02115. Pre-registration, including a $10 fee, is required. Must be 14 years or older to register. Registration is open! Begins and ends at the Shattuck Visitor Center, 125 The Fenway, Boston, MA 02115. Bring a refillable water bottle and wear comfortable walking shoes. Registration is open! After decades spent underground beneath a parking lot, a portion of the Muddy River has been uncovered to see daylight once again. Hear the story of how river and parkland were reclaimed and how the vision of Frederick Law Olmsted is being restored for the 21st century. Meet at REI, Landmark Center, 401 Park Drive, Boston, MA 02215. Bring a refillable water bottle and wear comfortable walking shoes. Registration is open! Looking for a fun and educational activity for your book club, garden club, class or church group? The Conservancy is pleased to offer privately-led interpretive tours of the Back Bay Fens. For more information, please contact Docent Coordinator Jeanine Knox at jknox@emeraldnecklace.org. Tour schedules are subject to change! Check back before your tour or call 617.522.2700 for updates. A walk through the centuries of a historic landscape. Hear the story of how Frederick Law Olmsted transformed an area of polluted waterways and mudflats into a scenic fens and the later 20th century revisions that resulted in the landscape we see today. 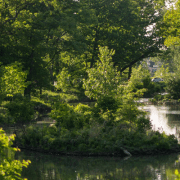 You’ll traverse the footprint of the restored Muddy River in the Back Bay Fens on this docent-led tour and hear the story of the river and how a piece of Olmsted’s landscape was reclaimed as parkland after spending decades paved over and used as a parking lot. 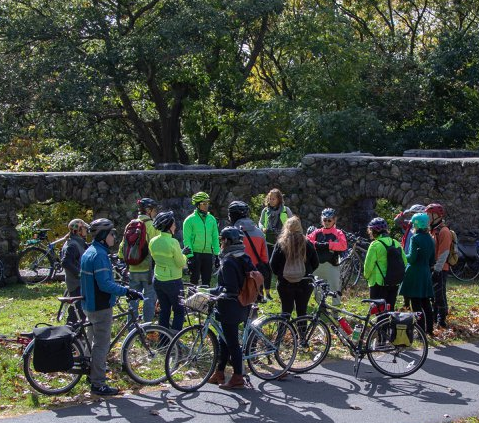 The best way to see the Emerald Necklace is to breeze through it by bike with a Conservancy docent! 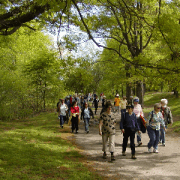 Join us for a tour of the parks from the Fens to the Arnold Arboretum. Must be 14 years or older. Enjoy a leisurely walk through the gardens of the Fens. You’ll take in the sights and scents of the historic Kelleher Rose Garden with its more than 1,500 roses and recently reconstructed fountain, and meander the paths of the oldest continually operating Victory Garden in America.